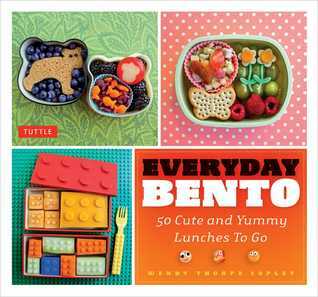 The launch of my book, Everyday Bento , is just a little less than a month away (March 4!). I got my first copy of the book earlier this week and I couldn’t be more thrilled with it. It was exciting to hold it in my hands, but I’m even more excited to share it with you. It’s available for pre-order now from Amazon , Barnes & Noble and Powell’s. Another way to get your hands on a copy is to enter the first of several giveaways that will be occurring in the coming weeks. My publisher, Tuttle, is giving away FIVE copies of the book on Goodreads right now. It couldn’t be easier to enter — click through the link below, then enter your contact information on the form. The giveaway runs through February 28, 2014. While you’re there, take a second to check out Everyday Bento’s Goodreads page and mark it as “to read”. P.S. If you’re looking for The Week in Bentos, it is moving to Mondays going forward. Check back next week for lots of inspiration for packed lunches!